Zahra Summayah (Founder of Manifesting Muslimah and New Muslimah Coach) has quickly been building a reputation for herself as an expert in overcoming trials and thriving in all areas of life, by putting Allah (swt) as the focus. Her following is gaining momemtum from her public appearances and collaborations with other acclaimed Muslimah experts. Screen shot of my hugely successful first Facebook Live webinar interview hosted by Suraya Sara (The Mindful Soul Academy) in November 2017. We had over 5000K views of our conversation " 5 warning signs you are in a toxic marriage". The brilliant Suraya Sara (Founder of the Mindful Soul Academy) and self -titled "Trauma Queen" hosted me in my very first Facebook Live Webinar where we chatted for nearly 2 hours about my E-book "5 Warning Signs You Are In A Toxic Marriage", Having survived and thrived from the unfortunate experience of 2 toxic marriages (pre and post Islam), Suraya invited me to discuss some much needed tips on how to identify if you are in a toxic marriage and also in the hope that these tips would serve as a forewarning and prevention from entering a toxic marriage in the first place. Since this interview, the Manifesting Muslimah focus has shifted from trauma to thriving with the focus put solely on Muslimah increasing their closeness to Allah (swt) and thereby strenghening their sense of self worth and wisdom. For today's #revertreflections I actually want to do something a little different: I want to give a shout out to another sister who is doing amazing work for new Muslimahs! 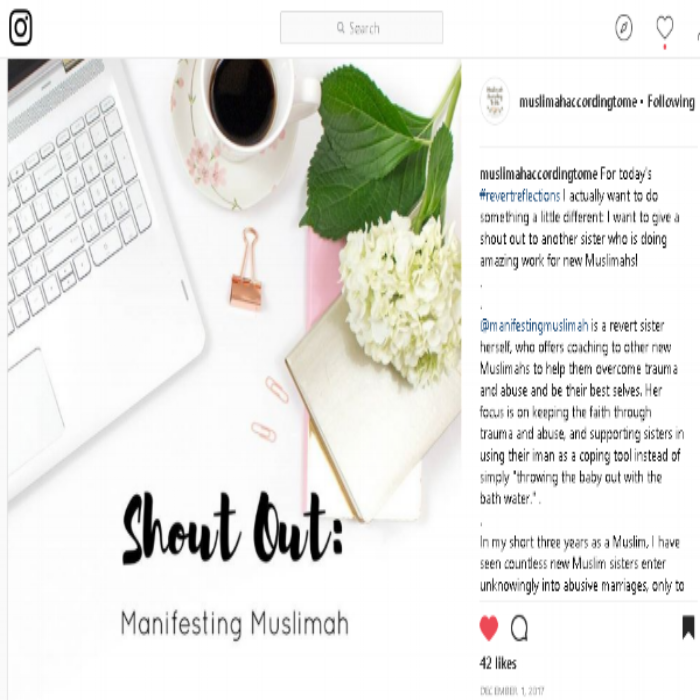 @manifestingmuslimah is a revert sister herself, who offers coaching to other new Muslimahs to help them overcome trauma and abuse and be their best selves. Her focus is on keeping the faith through trauma and abuse, and supporting sisters in using their iman as a coping tool instead of simply "throwing the baby out with the bath water." . In my short three years as a Muslim, I have seen countless new Muslim sisters enter unknowingly into abusive marriages, only to be completely pushed out of the fold of Islam by the experience. I have also known countless women who married a Muslim man and were interested in Islam, but due to his poor conduct have decided to forever shun the notion of converting. Watching this happen again and again and not being able to help is heaetbreaking for me, and this is why I feel so strongly about the work that she is doing. While this is such an important resource for reverts to be aware of, she does also work with born Muslim sisters! Many of the same issues come up, and many born Muslim sisters will need just as much support to keep the faith in these kinds of situations. So, if you are interested in coaching and support to help overcome trauma and connect to your deen, head over to her Insta page! You can also search Facebook for Manifesting Muslimah. If you want to get a preview of the kind of work she does, you can head over to her Facebook page and check out the webinar she just did on "The 5 Signs you are in a Toxic Relationship" I was there live, and it was amazing! muslimahaccordingtome@theladyofthehouse91 yes alhamdulillah she is doing amazing work! muslimahaccordingtome@woww.womensclub aw ma shaa Allah that's great 😊 yeah, alhamdulillah she is doing such important work! muslimahaccordingtome@woww.womensclub nope I am in Algeria actually! manifestingmuslimahSalam dearest sis, what a wonderful message of sisterhood and support to start my day with, jazakAllah khair. I have so much to learn from you and am grateful for this chance to collaborate with you in the service of Allah (swt) and our Deen. We Muslimahs have a duty to God to express our gratitude for creating us in the image of His perfection. And that starts with not letting anyone abuse or oppress us, particularly ourselves and our negative self talk and unhealthy behaviours. Coaching is less about dwelling in the past hurt and more about manifesting your marvelous self through lessons learnt, self enhancing choices and positive life fulfilling action; all with the pleasure of Allah (swt) as the focus. My coaching service is best suited to Muslimahs who are ready to give themselves the permission to move forward. My coaching is putting Allah (swt) and thriving Muslimahs as the focus, not toxic men; they have had more than enough of our mental and emotional energy. 😋 I do not want us to dwell in the negative but our all our energy into dream building, planning and activating the best lives we can for the sake of Allah(swt) 👑💕Peace and Blessing sister! manifestingmuslimah@woww.womensclub Salam sis, please join the New Muslimah Network in FB (closed group for Muslimahs) and like Manifesting Muslimah page -together we can inspire, empower and celebrate our Deen. Are you a New Muslimah struggling to keep your Faith in times of trouble? Are you regularly exhausted defending your faith to others? Are you feeling lonely? I have the answer for you, a free gift that will give you some tips to move forward because Allah helps those who help themselves. Watch my interview and sign up to grab your free 7 step guide to holding firmly to your Deen with confidence, clarity and certainty. Once you grab your 7 Step Faith boosting guide, I will take you on an 8 week Faith Boosting email journey. You can book a consult with me through this website at any time. This free ME First Revolution interview series features 40+ speakers sharing their life experience and strategies and will focus on the actionable strategies you can use to put yourself first, thrive & be the marvelous muslimah you are while taking charge and living your dream life. Be inspired to think your way into feeling fabulous after 40, no matter what is going on in your life. My adult life has been marked with chronic illness, a major head injury, two abusive marriages, divorce and Faith conversions. All along the way I have dug deep tackling the self-limiting beliefs behind some of the poor decisions I have made. I have done this while nurturing an attitude of gratitude for all the good things in my life, including these learning opportunities. Now I am a 46 year old single Muslimah who is focused on creating the fabulous life that Allah (Swt) wants for me, and I am doing this one thought at a time. I know how vital it is to understand the difference between the scarcity and abundance mindsets, and by making this critical mental shift, you will be able to finally set yourself free and experience the fulfillment Allah(SWT) has made available for you! My tough journey has led me to be so committed to empowering women to transform their mindset, recognize their strengths and talents, and finally, to help them transform into the strong, passionate, successful Muslimahs they were born to be!